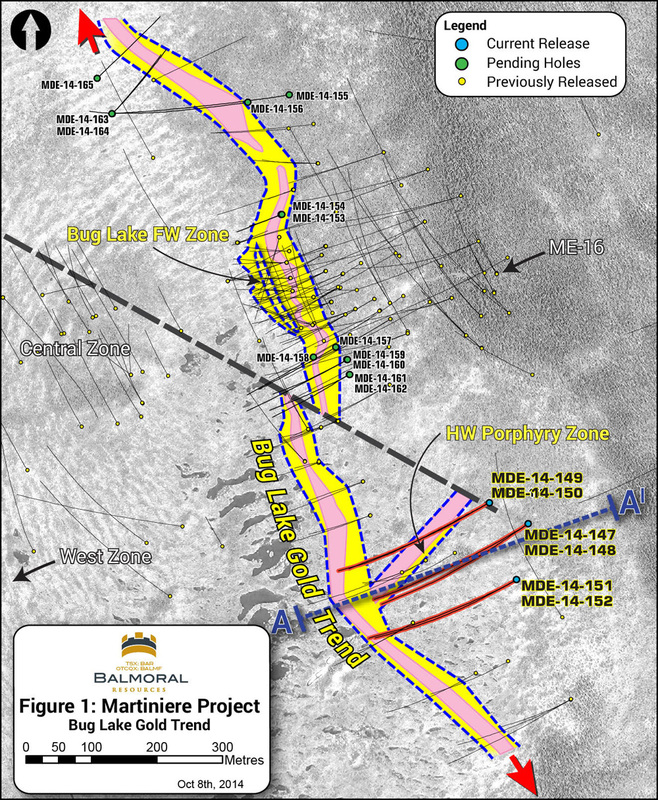 (Vancouver, October 8, 2014) Balmoral Resources Ltd. (“Balmoral” or the “Company”) (TSX: BAR; OTCQX: BALMF - http://bit.ly/1iUP9nS ) today reported results from the first six holes of the summer 2014 drill program on the Company’s wholly owned Martiniere Property. All six holes tested the southern extension of the Bug Lake Zone (see Figure 1 and Figure 2), intersecting high-grade gold mineralization along the upper contact of the Bug Lake Porphyry. Today’s results further demonstrate the continuity of the Bug Lake system. Results were highlighted by intercepts of 12.50 g/t gold over 7.99 metres, including 132.50 g/t gold over 0.72 metres in drill hole MDE-14-147 and 5.23 g/t gold over 7.28 metres in drill hole MDE-14-149. The southern extension of the Bug Lake Zone has been intersected for 650 metres along strike and remains open to the south and to depth. 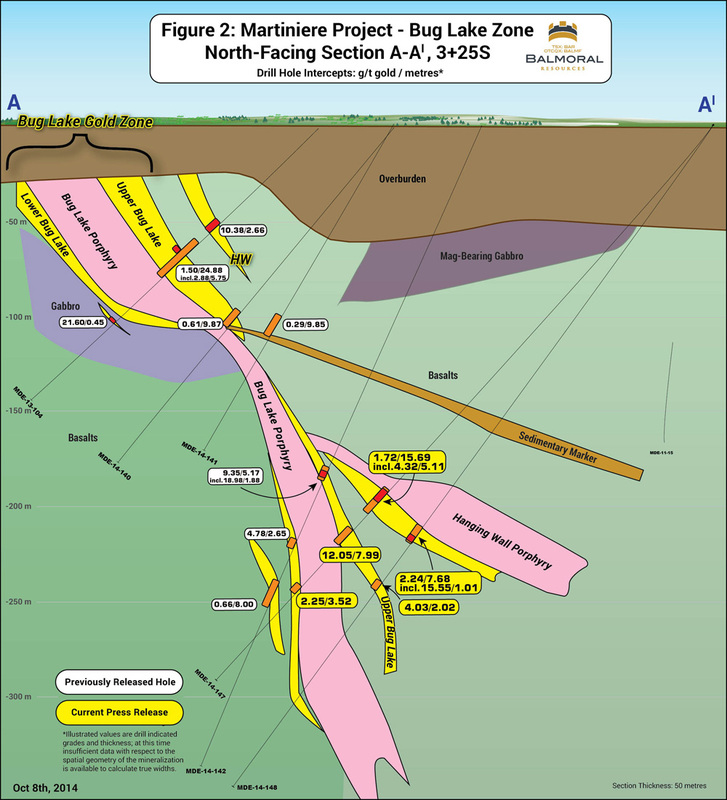 In addition, the Company has confirmed a new discovery – the HW Porphyry Zone – which occurs along the lower contact of a northeast striking, south-east dipping porphyry sill located east of the Bug Lake Zone. This new zone appears to be open in all directions and features results of 5.11 metres grading 4.32 g/t gold in MDE-14-147 and 2.89 metres grading 12.30 g/t gold in MDE-14-149. Additional vein style gold mineralization continues to be intersected in the hanging wall and footwall to the main Bug Lake Zone. The north-south trending Bug Lake Zone locally transects northeast striking, stratabound massive sulphide units both to the east and west of the Zone. Gold bearing intercepts associated with these sulphide horizons exhibit strongly elevated silver (3.5 to 92.1 g/t) and zinc (0.1 to 1.4%) values, suggesting potential for polymetallic sub-zones within the broader Bug Lake system. Fourteen additional holes, completed along the northern segment of the Bug Lake Zone, remain pending.